edge blu enables the user to make fast, accurate pH measurements wirelessly using the Hanna HALO™ Bluetooth digital sensor. Each HALO™ probe has a unique serial number. Once connected to the meter, the probe is ready to measure pH along with temperature. The user interface permits you to adapt edge blu to your exact measurement requirements. The intuitive design simplifies configuration, calibration, measurement, data logging and transfer of data to a USB thumb drive or computer. edge.blu also offers a basic operation mode that streamlines measurement configuration and is useful for many routine applications. edge blu is versatile in many ways. 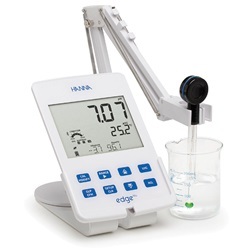 The slim meter and probe can be used as a portable device (using its rechargeable battery) or used in its bench or wall cradle (that also power the meter) as a line-powered laboratory instrument. HI11102 HALO pH electrode uses Bluetooth Smart Technology (Bluetooth 4.0). This technology offers low power consumption allowing for a long, 500-hour battery life. The range of the Bluetooth connection is 10 meters (33') between the probe and the receiving device. The probe automatically shuts down when out of range.